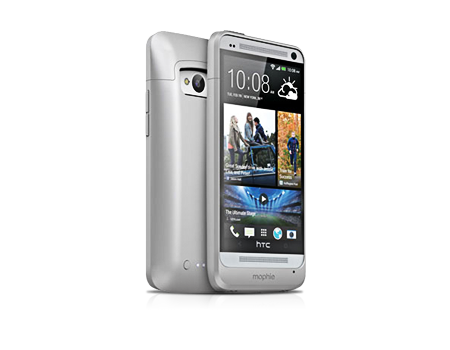 The Mophie HTC One Battery Case adds up to 100% battery charge to your phone in a lightweight, low-profile case. This protective hard case with an integrated rechargeable battery is designed to double your power. No more worrying about bumps, scratches, or having to search for an outlet in the middle of the day. Just flip the switch and charge anywhere. Designed to support key features of the HTC® One®, the Juice Pack's pass-through design allows you to access the universal remote without removing it from the device as well as provide full accessibility to buttons, speakers and camera. You can flip through your favorite shows and stay powered up at the same time.